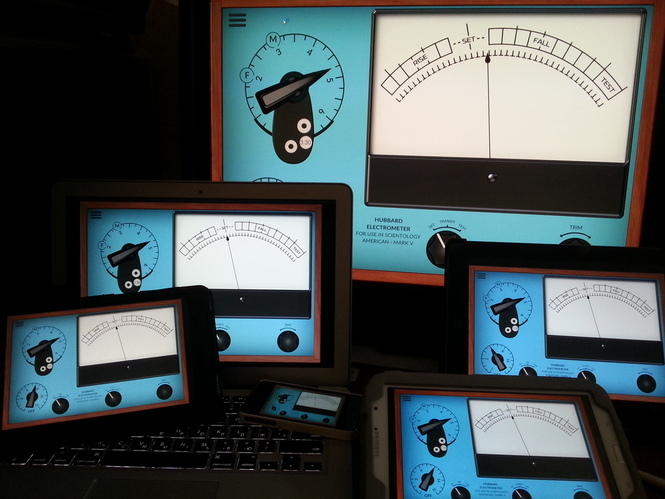 Theta-Meter e-meter program for iOS, 2014 edition. Program can be found in AppStore under the name GSR Meter. At the moment this is the only e-meter program in the world, which can work with iOS. Among all programs for e-meter GSR Meter for iPad is the standard - comfortable interface, easy to use in the session, perfectly smooth needle movement, reliability. If you are accustomed to choose only the best, the Theta-Meter + iPad is your choice. What you need to work in iOS (with iPad, iPhone, iPod)? For this you should buy Theta-Meter Wi-Fi Access point and one of USB Theta meters. Connect Theta-Meter to the access point, turn on the power, connect the iPad to Wi-Fi acces point, start the program GSR Meter and go in session!